1. It's the best made piece of plastic engineering I have seen for ages - beautifully made with superb attention to detail. 2. It's transformed the bike - the wind noise and buffeting induced by the original screen was so unpleasant that I was seriously considering selling what is otherwise a brilliant handling and performing bike. 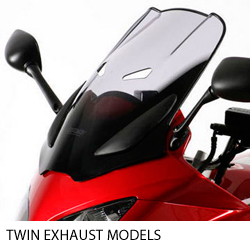 Now its smooth right to the max, quieter and more stable at high-speed. All logical! 3. Finally - thank you for your efficient service - it's much appreciated." 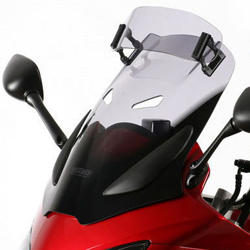 !quote, 45889, windshields, wind, shields, windscreen, motorcycle, motorbike, sportsbike, vision, vario, touring, screens, vario-screens, vario-shields, gray, grey, tinted, smoked, ecran, vent, pare-brise, 2006, 2007, 2008, 2009, 06, 07, 08, 09, 6, 7, 8, 9, cbf, 1000! I wish that I had bought this screen first before wasting my money on more expensive screen that did not work. Great build quality all screw fixings in the correct position. 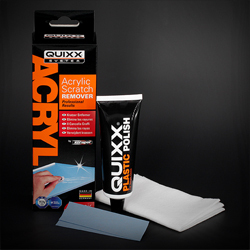 "I fitted the Screen and it went together very well, and it made a considerable difference. You can actually feel the difference, before my head was moving about - there was none of that, none of that at all. It's surprising how you can adjust it both ways, I went for the bigger one as I'm quite tall and you can adjust it both ways, the engineering on it is brilliant." 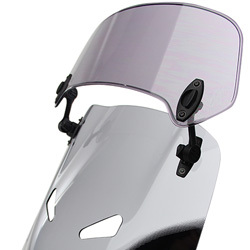 !quote, 57804, 4025066126576, windshields, wind, shields, motorcycle, vision, xcreen, xscreen, x-screen, x creen, x screen, screens, gray, grey, tinted, smoked, 2006, 2007, 2008, 2009, 06, 07, 08, 09, 6, 7, 8, 9, cbf, 1000!